The Jerusalem Archaeological Park, situated on the Ophel. Looking east, with the Mount of Olives in the background. The mount is covered with the graves of 150,000 individuals awaiting the coming of the Messiah and their resurrection. Jerusalem is a powder keg loaded with nuclear potential. No city on Earth is so fraught with tension! The Arabs and Jews are in a bloody deadlock over “peace” negotiations, but they will never agree on anything regarding Jerusalem. “Thus saith the Lord of hosts, the God of Israel; Ye have seen all the evil that I have brought upon Jerusalem, and upon all the cities of Judah … Howbeit I sent unto you all my servants the prophets, rising early and sending them, saying, Oh, do not this abominable thing that I hate” (Jeremiah 44:2, 4). Repeatedly throughout the Bible, God affirms how much He wants to help and protect the Jews. To this day, God’s chosen people—even the entire world—reject Him! “If I forget you, O Jerusalem, let my right hand wither! Let my tongue cleave to the roof of my mouth, if I do not remember you, if I do not set Jerusalem above my highest joy!” (Psalm 137:5-6; Revised Standard Version). The scribe Ezra probably wrote this passage, most likely after the Jews returned from Babylonian captivity. He wanted to make sure the people didn’t make this mistake again. It is so important that we keep our minds on Jerusalem! King David loved Jerusalem (Psalm 122). He knew what this city would one day become. If we understand the vision of Jerusalem, we will see that its future is loaded with good news! David knew that the world to come would revolve around Jerusalem (Isaiah 62:1-7). Later on, the whole universe will revolve around Jerusalem too! (Isaiah 65:17-19). God the Father will live in new Jerusalem. Does anything eclipse this as our number one joy? “My days are like a shadow that declineth; and I am withered like grass. But thou, O Lord, shalt endure for ever; and thy remembrance unto all generations. Thou shalt arise, and have mercy upon Zion: for the time to favour her, yea, the set time, is come. For thy servants take pleasure in her stones, and favour the dust thereof” (Psalm 102:11-14). Our Jerusalem archaeological endeavors fit into this prophecy. One of Jeremiah’s accusers, Gedaliah the son of Pashur, had his name stamped on a small clay seal that was discovered back in 2008 …. This discovery followed one from three years earlier of another seal with the name of Jehucal, the son of Shelemiah, on it. This man is mentioned twice in the book of Jeremiah. These two princes worked hard to petition King Zedekiah of Judah to kill the Prophet Jeremiah. They didn’t succeed, but they did get Jeremiah thrown into prison twice. They hated his warning message. The Babylonian armies besieged Jerusalem and took the Jews captive. They killed all of Zedekiah’s sons and the nobles of Judah before putting out Zedekiah’s eyes. They didn’t want anybody left to rule on David’s throne. The whole world believes that David’s royal line ended, but God kept His promise to make it last forever. King Nebuchadnezzar of Babylon released Jeremiah, who then took the stone of destiny and one of Zedekiah’s daughters to Ireland. The throne was preserved and established there. The Messiah will rule from that throne, in Jerusalem, for all eternity. What a vision this city holds! Until King David’s palace was found, archaeologists had found virtually NOTHING from David’s period in Jerusalem! The same is true about Nehemiah’s period, before the discovery of Nehemiah’s wall. There have been a few archaeological finds from Jeremiah’s time, but NONE of them show how violently he was persecuted like the two bullae [clay seals] recently found. These bullae give us a strong insight into why God destroyed the temple and Jerusalem! “Think about what revolves around those bullae, and the meaningful Bible history and prophecy tied to those artifacts,” I wrote. David’s throne was once in David’s palace where these two clay seals were discovered. Descendants of David will continue to rule from his throne all the way up to the coming of the Messiah. He will then bring redemption to the entire world. Archaeology points us to this magnificent future! Most Bible prophecy is dual. The Jews imprisoned Jeremiah because they couldn’t bear his message. Similarly, the world today hates our message! Jeremiah warned the Jews, but his biblical account is addressed to Israel, which includes America and Britain primarily, as well as the Jews. The main fulfillment of his warning happens in this end time! “The word that came to Jeremiah from the Lord, saying, Thus speaketh the Lord God of Israel, saying, Write thee all the words that I have spoken unto thee in a book. For, lo, the days come, saith the Lord, that I will bring again the captivity of my people Israel and Judah, saith the Lord: and I will cause them to return to the land that I gave to their fathers, and they shall possess it” (Jeremiah 30:1-3). Archaeology proves the history of Jeremiah true! It also proves the prophecy of Jeremiah true! Jerusalem archaeology prophesies. In the summer of 2007, Eilat Mazar, whose grandfather was the late Prof. Benjamin Mazar, began an emergency dig near the top of Jerusalem’s famous Stepped Stone Structure in order to repair a collapsing tower. Under the tower, she found a rich assemblage of pottery and other finds. She concluded that the tower must have been built by Nehemiah after the Jews returned from Babylonian captivity to rebuild the temple and repair the walls around Jerusalem. We absolutely agree with her conclusion. [A]nd they spake unto Ezra the scribe to bring the book of the law of Moses, which the Lord had commanded to Israel. And Ezra the priest brought the law before the congregation both of men and women, and all that could hear with understanding, upon the first day of the seventh month. And he read therein before the street that was before the water gate from the morning until midday, before the men and the women, and those that could understand; and the ears of all the people were attentive unto the book of the law” (Nehemiah 8:1-3). The Jews had a humble, teachable attitude after 70 years of captivity in Babylon. God brought them to repentance. Ezra taught them during the Feast of Tabernacles (Sukkot), and they valued God’s Word deeply. They even stood when the Bible was opened! (verse 5). Must we learn this reverential attitude the hard way? God prefers to teach us using words, but He will resort to hard punishment if we refuse to listen. The Jews wept when they heard Ezra teach from God’s law (verse 9). They were so thankful to receive the truth again, and so ashamed that they had neglected it in the past! Ezra taught the law. Nehemiah helped to rebuild and fortify Jerusalem. Zerubbabel constructed the temple. Haggai and Zechariah wrote end-time prophetic books consisting of history that will soon repeat itself. Finding Nehemiah’s wall is about prophecy! Nehemiah’s wall surrounded and protected Jerusalem. God builds a protective barrier around spiritual Israel, His chosen people in this end-time. We must stay close to God to keep that wall intact. “Then he said unto them, Go your way, eat the fat, and drink the sweet, and send portions unto them for whom nothing is prepared: for this day is holy unto our Lord: neither be ye sorry; for the joy of the Lord is your strength” (Nehemiah 8:10). How do we obtain joy? By seeing the vision of Jerusalem! Through trials and tests, God helps us grow into sons in His Family! “Who is left among you that saw this house in her first glory? and how do ye see it now? is it not in your eyes in comparison of it as nothing?” (Haggai 2:3). The older Jews compared Solomon’s temple to Zerubbabel’s and became discouraged. Physically, Zerubbabel’s temple wasn’t nearly as nice. God cares most of all about the spiritual temple, which He considers greater by far! But we must protect it by being close to God and heeding His Word. Dr. Eilat Mazar has also uncovered Solomon’s wall that surrounded Jerusalem. Solomon’s reign was a time of unparalleled splendor, prosperity and every blessing conceivable. That is a type of the world to come, when God will give all people peace and abundance forever! These good fruits will then extend out into the universe. “And the Lord said unto Satan, The Lord rebuke thee, O Satan; even the Lord that hath chosen Jerusalem rebuke thee: is not this a brand plucked out of the fire?” (Zechariah 3:2). God has chosen Jerusalem—no other city in the world! After 1,000 years, the dazzling new Jerusalem will descend from heaven and replace Jerusalem. God will rule from this city for all eternity. This is a drop-dead vision! It should fill us with joy. 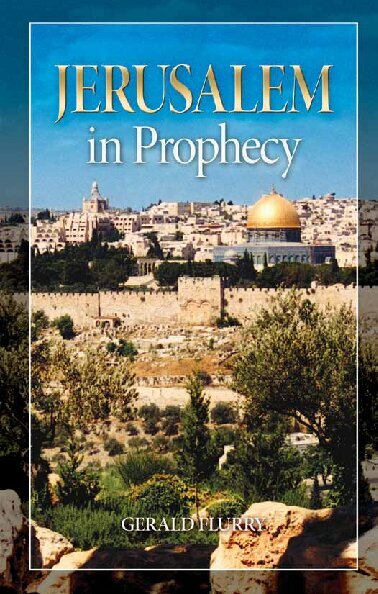 Click the above image to order a free copy of Jerusalem In Prophecy, or read online. “The grass withereth, the flower fadeth: but the word of our God shall stand for ever. O Zion, that bringest good tidings, get thee up into the high mountain; O Jerusalem, that bringest good tidings, lift up thy voice with strength; lift it up, be not afraid; say unto the cities of Judah, Behold your God!” (Isaiah 40:8-9). These archaeological projects are a part of crying out to the modern-day tribe of Judah—the Middle East nation of Israel! We have assisted in the discovery of artifacts from the periods of David, Jeremiah and Nehemiah. These finds verify the truth of the Bible. What an honor to participate in such an inspiring Work.